1 Piece of wood wall clock、Certificate、Instructions、Warranty. KAMEISHI 12-inch wood wall clock is a simple design clock suitable for any room decoration. Perfect size which is only 12 inches. High-quality Quartz Sweep Movement guarantees accurate time and absolutely silent environment. KAMEISHI is you best choice. 1. Large points and clear glass lens guarantee good view, even from side. 2. Strict production process control and quality materials make our clock tough enough for indoor use. 3. Durable package guarantees our clock in a good condition during shipment. 4. Strict pre inspection for every clock before shipping. Quality assurance. We promise to replace defective product for you within 3 months. If you have any question, Please feel free to contact us by Amazon Email or After-sales Email (maochuanling888@163.com). ✔. Non ticking. Quiet sweep second hand, no ticking to ensure a good sleeping or working environment. ✔.Clear to read, Special and elegant design meet all your decoration need. ✔. 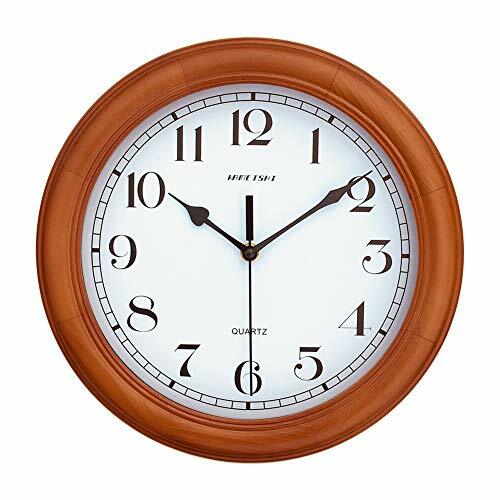 Perfect clock for dining rooms, living rooms, family rooms, bedrooms, study room, kitchen, office, or conference room. ✔. A manual setting： Applicable to the Four selected US time zones Eastern, Central, Mountain, or Pacific (ET, CT, MT, or PT)and Any other time zones and area. ✔. Requires one AA alkaline battery (not included); battery lasts approximately 1 year. If you have any questions about this product by KAMEISHI, contact us by completing and submitting the form below. If you are looking for a specif part number, please include it with your message.